Kami Persse didn't intend to meet her new neighbors this way. Just after 5 p.m. Dec. 20, a day after Persse and her family moved into West Linn's Willamette neighborhood, she found herself driving down the street in her van and screaming for help. Her 8-year-old daughter had been running down that same street earlier before Persse asked her to go back home and watch her younger siblings. But Persse's daughter wasn't the 8-year-old she was worried about. That would be Norman, a horse that managed to escape not once but twice from Persse's property that evening. "My 8-year-old was hysterical running down the street chasing him," Persse said. "I was driving in the van and yelling at neighbors to call the police." The saga began when Persse's daughter forgot to latch up the side pasture entrance. Norman, a Pony of the Americas breed, took off down Willamette Falls Drive. Police were called when Norman was spotted running through traffic near Willamette Falls Drive and 9th Street. Resident Patti Obana was driving along Willamette Falls Drive toward the Willamette area when she spotted him. "I saw police lights ahead of me, and all of a sudden I saw galloping feet," Obana said. "I thought it was a deer, and as it passed I saw it was a horse. I couldn't pull over because there were cars behind me. "He was galloping like he had somewhere to go." Another resident, Barbara Gottlieb, wrote on Facebook that she tried to block Norman's path with her car to keep him out of traffic. Police eventually arrived and caught Norman with Gottlieb's help. "They found him and called a trailer," Persse said. It seemed at first that the crisis was over, but Norman had other ideas. "I didn't realize he'd gotten out the side pasture — I thought he'd gone out the front gate," Persse said. "So I hadn't shut (the side pasture) … I put him in and turned around and gave him a treat, and he was trotting up the road again. I could actually hear his little hoof beats." Luckily, Norman took safety precautions for his evening run. "The only thing that saved him was he was wearing a pink (horse) blanket, which is kind of a joke because he's a boy," Persse said. "It was so bright that the cars saw him that way." Police were able to catch Norman once again, and Persse eventually led him back home along Willamette Falls Drive. 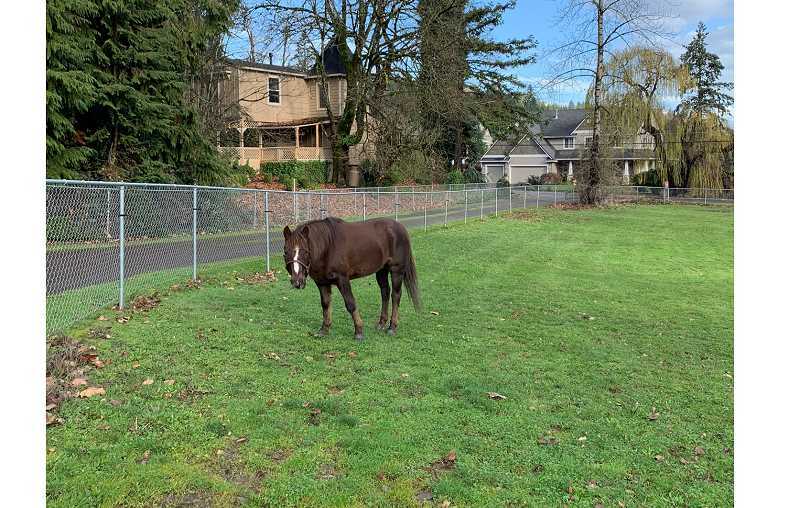 "Both times, citizens were trying to help (but) actually moved the horse further away from its property — from 9th and Willamette Falls Drive all the way to Chestnut (Street in the Sunset area)," West Linn Police spokesperson Jeff Halverson said. Persse, for her part, said the ordeal was "awful" in the moment, but soon evolved into a comical memory once Norman was home safe. "He's doing well and happy. We think he really likes it here," she said. "He had a lot of fun last night."